Popular payment provider PayPal has released an updated version of its iPhone app that introduces a number of new features. Most interesting is the integration of the “bump to communicate” feature first introduced by the Bump app (which you may remember as the billionth download from the App Store). The PayPal app allows you to send money to another person by simply entering an amount and gently “bumping” your iPhone against theirs. PayPal, one the world's largest online payment providers, has so far failed to make significant inroads into the mobile space—particularly in North America, where it faces competition from upstarts like Square, founded by Twitter co-creator Jack Dorsey. Square plans to offer a dongle that plugs into a smartphone's headphone jack and allows on-the-spot swiping and charging of a customer's credit card, augmented by features like payer authentication and digital signatures. 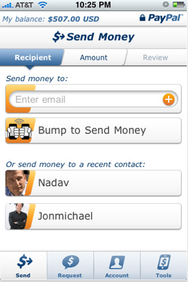 The PayPal app is free and can be downloaded from the App Store; it requires an iPhone or iPod touch running iPhone OS 3.0 or later.